Our Tierra Drive Remodel project is a unique one for us because we were hired as consultants for the full remodel. The clients were experienced in project management, so we were able to focus exclusively on the remodel design. 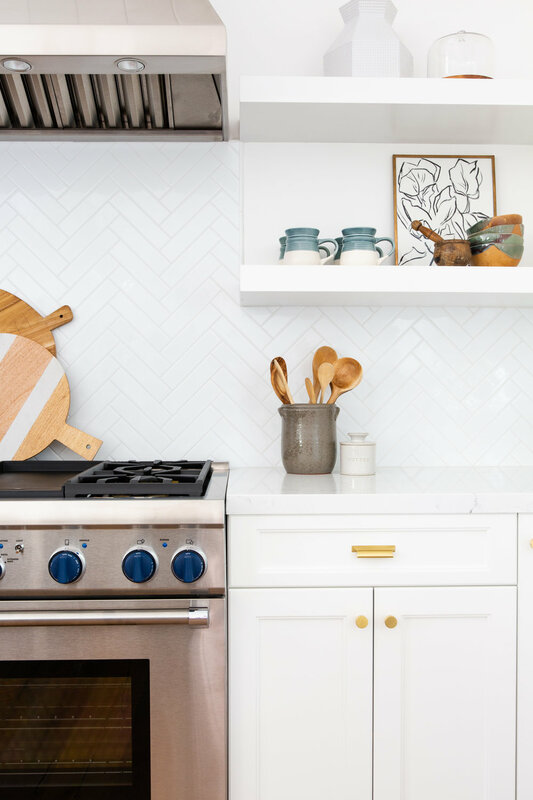 The existing home was straight out of the 60’s with low ceilings, a choppy floor plan, carpet in every room, a rock fireplace and a small, dark galley style kitchen. To start knocking out the list of design needs, we began with the original plans and worked with the architect to begin taking out all the walls of the home. Once we received the architects draft, we then drew our plans directly over his and decided to move the existing powder room to give more room and flexibility in the kitchen. Once we had the main living areas configured, it was time to finalize design plans to finish opening up the space. 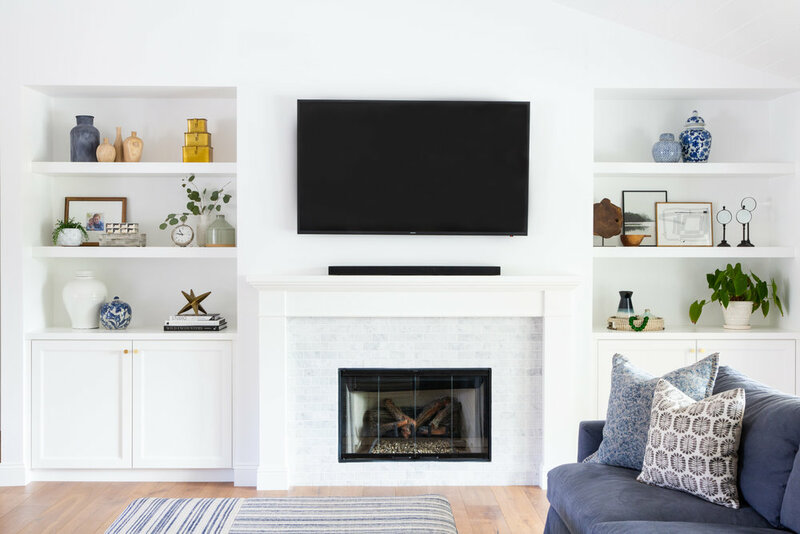 We presented our clients with a new design for a sleeker, more modern fireplace (buh-bye square footage sucking rock wall) and vaulting the ceilings to make the space feel larger. Our clients hesitated to raise the ceilings at first, but ultimately trust our vision. We found the largest beam possible to support the open floor plan concept and the result is truly so stunning. Our clients had a clear vision of what they wanted the finished product to look like, so we helped select paint colors, hard surfaces, and styled their existing furniture. 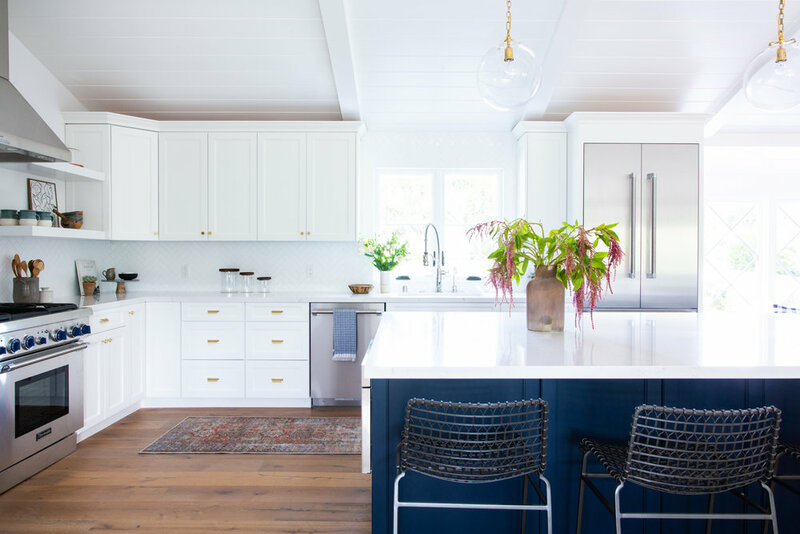 We went with Chantilly Lace by Benjamin Moore for the walls and cabinets throughout the house and Hale Navy on the kitchen island. The final result is an incredible example of what a collaborative process can bring to a remodel! Stay tuned to see how we created a laundry room out of nothing, expanded a luxurious master bathroom and redid the boys bathroom, too.